In this study, the oxidative polymerization of orcinol monohydrate using different oxidants such as NaOCl, H2O2, and air was investigated. Polymerization studies were carried out between 50 and 90 °C. The optimum reaction conditions of the polymerization were also established. NaOCl was found to be the most active oxidant. The characterization of oligo(orcinol) was conducted by using FT-IR, 1H-NMR and 13C-NMR, TGA, size exclusion chromatography (SEC) and solubility techniques. At the optimum reaction conditions, the conversion to oligomer of orcinol was found to be 62% (for NaOCl oxidant), 42% (for H2O2 oxidant), and 21% (for air oxidant). According to the SEC analysis, the number-average molecular mass (Mn), mass-average molecular mass (Mw) and polydispersity index (PDI) values of oligo(orcinol) were determined to be 2260, 2540 g mol−1, and 1.12, using NaOCl, and 2170, 2470 g mol−1, and 1.14, using H2O2 and 1500, 1770 g mol−1, and 1.18, using air, respectively. 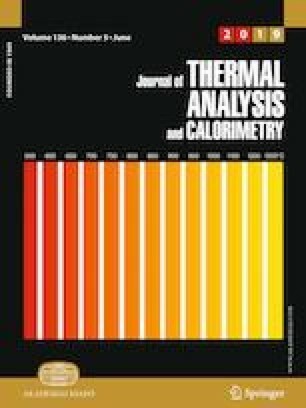 In addition, the relationship between molar mass distributions and activation energies of thermal degradation processes of oligo(orcinol) was investigated by using TG analysis. For this purpose, the methods based on multiple heating rates such as Flynn–Wall–Ozawa [FWO], Tang, and Kissinger–Akahira–Sunose [KAS] were used. The activation energy related to the solid-state decomposition of oligo(orcinol) synthesized with NaOCl oxidant was calculated to be 79.02 kJ mol−1 by KAS method, 78.74 kJ mol−1 by Tang method and 81.78 kJ mol−1 by FWO method in the range of 0.05 < α < 0.95. The results obtained show that activation energy increased with an increase in molar mass.